San Bernardino County, the largest county in the United States, stretches all the way from Southern California’s Inland Empire to the California-Nevada state line. In addition to numerous farms and other agricultural businesses, the county is home to Amy’s Farm, a polyculture-oriented farm in Ontario with a focus on education; Huerta del Valle, a robust community garden in Ontario; and the Upland-based Incredible Edible Community Garden. Thanks to people like Arthur Levine, local and urban agriculture in San Bernardino County is experiencing a burgeoning grassroots movement. Originally from New York City, Levine learned in school how growing food provides pathways to community and political power, and became involved in local food and agriculture efforts. After high school, he moved west to attend Pitzer College in Claremont. He wanted to be involved in the same kind of work, but could not find anything similar to get involved in. “San Bernardino County was 10 years in the past,” he says. Upon his arrival in San Bernardino County, Levine took notice of several facts: huge backyards; a strong agricultural heritage in the county being built over with new homes and warehouses; and the presence of a large immigrant population, many of whom had experience in agricultural work. Los Angeles was too far away, so Levine became interested in starting something new locally. This materialized into the Huerta del Valle Community Garden in Ontario. The mission of Huerta del Valle is to bring members of the community together in growing their own organic crops. Levine believes that people who work together to grow their own food also build community, sustainability, health, vocation and relationships. In other words, wholeness. 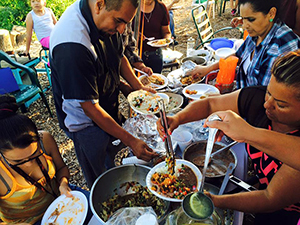 Initiated in 2010, Huerta del Valle is engaged in the work of food justice, with support from Pitzer College. Currently, 52 family plots are being managed, along with communal growing areas and a two-acre urban farm that grows vegetables for selling. From its inception, Huerta dell Valle has had a robust composting program (1,000 pounds a day of food waste). Yet it’s land, which is so necessary for an urban agriculture operation, which is often in question. Levine is also working on changing policy—this includes making it legal to raise chickens in urban settings. As he continues to involve people in the production of their own food, he strives to educate young people about the importance of local food production. He has done several presentations at public schools in Upland. He also has a vision of expanding urban agriculture in more areas of San Bernardino County. “Why not replicate this?” he asks. Also in Ontario is Amy’s Farm, a polycultural operation centered on sustainable and organic production. It was founded to give residents of Southern California the opportunity to visit a working urban farm. Its thousands of annual visitors learn about the half-acre garden at Amy’s Farm and ways they can garden themselves; the cyclical nature of the farm and how nothing goes to waste; and the humane raising of chickens, pigs and cows. Amy’s Farm also sells produce on-site and at the Pomona Farmers’ Market, provides volunteer opportunities, and offers a variety of classes. Bekendam also knows that the impact of his farm in urban San Bernardino County can be quite powerful. A like-minded operation is the Incredible Edible Community Garden, co-founded and operated by Mary Petit and Eleanor Torres. Similar to Levine, Petit looked for a community garden but could not find one. So together with Torres, she began her own garden. Through involving lower-income people in their garden (which consists of numerous sites, not contiguous), they address the very real issue of food insecurity in San Bernardino County. “There are opportunities in San Bernardino County, given the huge issues it faces,” says Torres. The Incredible Edible Garden consists of 14 sites, including nine community gardens, two aquaponics facilities and three community fruit parks.